Monday, January 2nd afforded me the opportunity to go on a solo birding adventure to Antelope Island, easily one of the hottest birding locales in Utah. I saw 47 species that afternoon. Here are a few I photo-documented. As the ABA Bird of the Year coordinator, I want to pay homage to the current reigning bird of the year, the American Kestrel with three images. American Kestrels, although beautiful and petite are good enforces of the law. Northern Pintail - this was the closest I've ever been to one. I always thought of them as being a very sleek looking duck. Now I'm thinking they have a nice brown velvety teddy bear head, the kind that kids love to cuddle with. I love that gun-metal black glossy bill. The black and white pattern on the flanks is amazing if you can zoom in to see it. Rough-legged Hawk - there were a dozen or so of them soaring over the island. That dark square patch on the wings is helpful characteristic for identification. At one point I watched a Roughie, a Harrier, and a Prairie Falcon all three in a tangle with each other. It was pretty cool to see, but you would have had to be there to appreciate. I thought Virginia Rails were supposed to be illusive skulkers in the reeds and that they were supposed to migrate for the winter, but here is an over-wintering Virigina Rail that hung out in the open for about a half hour at the spring at Garr Ranch on Antelope Island. I got do a little birding outreach by introducing several passers-by to this awesome bird. People were actually fascinated. Too far out for my 150mm lens, but good enough for i.d. confirmation. Three White-winged Scoters. Awesome!!! I was on the island that day too Robert, sorry I missed seeing you! Birds all have their own little personalities, don't they? Great shots Robert, the Northern Pintail pic is really beautiful. Great images of some really cool birds! Antelope Island really seems like the place to go for some incredible birding. Loved the post, Rob! Owls, Kestrels, shrikes and a rail...what a great trip! Wow, sounds like a fabulous day of birding! Love the snoozing Great-horned Owl shot and the awesome Rough-legged Hawk image! Northern Pintails are especially lovely. 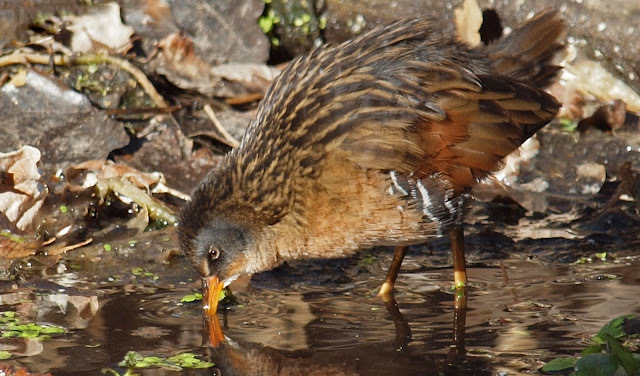 Lucky for you that the Virginia Rail was feeding out in the open. Great capture! All of your photographs are terrific! Awesome post! Awesome, indeed! Marvelous birds and marvelous photos too! I love the kestrel and am so happy that it was chosen as bird of the year. Stunning photos...I really enjoyed the Owls. Very interesting photos Robert. Some of these birds seem like old friends to me I've seen them so often out there. Neat shot(s) of the shrikes! - a species very difficult to get in flight. Enjoyed this post a lot. Robert, you went birding at one of my most favorite spots in the world, but you already know that! and you are so far ahead of me with your bird count! I need to get going! Great post! Did I mention that you have landed in birding heaven? 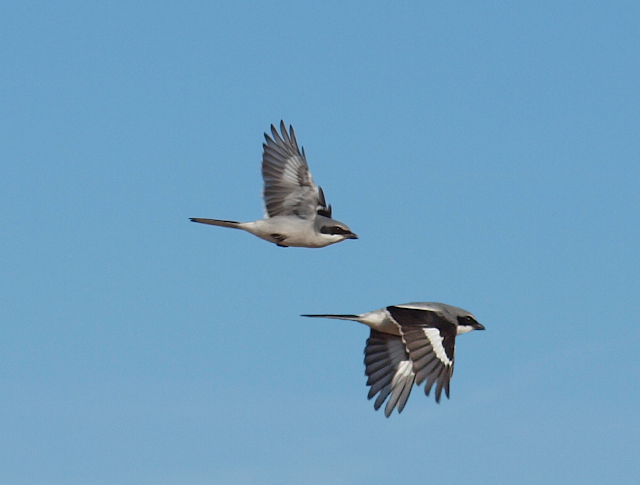 I like the Loggerhead Shrike photo. Great! This bird comes to Bahrain in winter-spring season!